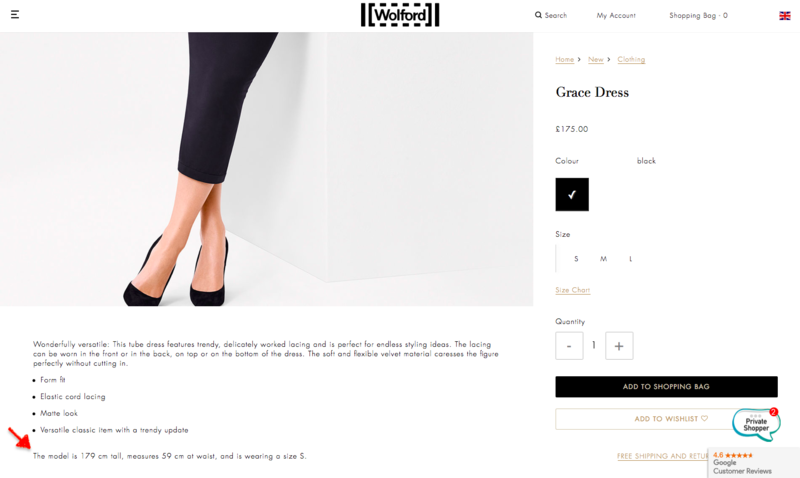 Wolford recently renamed one of its bodysuit range on their U.S. and U.K website. The string body, which includes Wolford’s bestseller Colorado String Body, are now called “thong” body. Interestingly, the “string body” is still used on the Austria website. I believe the items are exactly the same; only named differently. One addition that comes with the 2018-19 Autumn-Winter collection is sizing reference. All new items are now displayed with the height and measurements of the model and the size she is wearing (see images below, where the red arrow indicates). This will give customers an idea what size to go for. One note though, I find it hard to comprehend that the model is wearing size S tights despite being 179cm tall. I recommend to go with your usual size on this one.